New American Press, 9780984943944, 224pp. 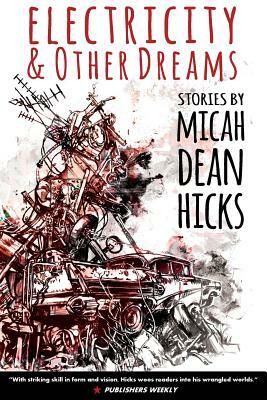 The beguiling stories in Electricity & Other Dreams are in their own category, which might be described as Southern gothic meets tall tale meets dirty realism. In these magical yet down-to-earth stories we meet an old man made out of cans, an electrician who makes light simply by touching a bulb, a weatherman who arranges his own weather, a plumber who also gets rid of ghosts. Fortune cookie fortunes actually come true, alligators work in a factory, and Japanese warlords battle on a jet plane. And then there's the killer crawfish. Every story in this fantastic collection is gorgeously gritty and lots of fun. Micah Dean Hicks is a true original. ELIZABETH STUCKEY-FRENCH O. Henry Award-winner and author of The Revenge of the Radioactive Lady.